So you wouldn't think these towels would be amazing but they rock!! I live in a tiny apartment and space is limited. These towels take up little space, are multi functional (a plus) and so soft. I will NEVER buy a traditional towel again!! Show off your style with this pretty Turkish cotton towel. Perfect for beach, bath, and everything in between, it is handmade in Turkey and designed to dry quickly, which reduces mildew. It also folds up tightly for easy carrying. The machine-washable design makes your towel softer and more comfortable with each use. 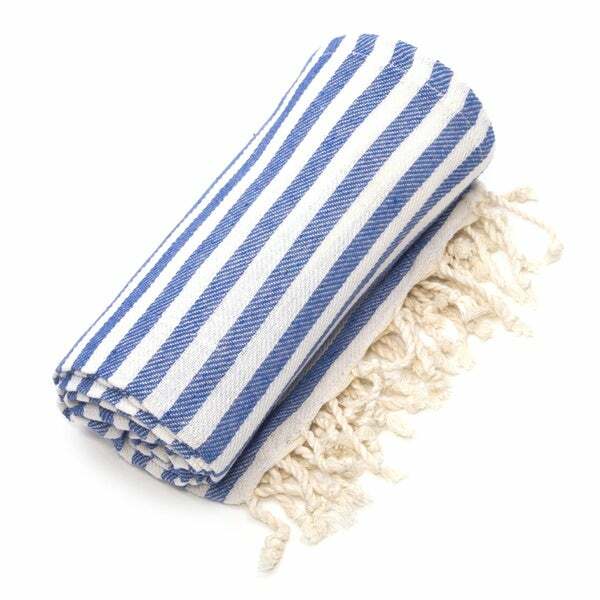 Use this practical Turkish-style towel at the pool, in a massage spa or at a yoga studio. Each towel is handmade, and each tassel is hand-twisted, creating a distinctive look that dresses up your bathroom, pool house or home gym in a unique way. The towel folds into a surprisingly small shape, making it easy to carry with you in your beach bag. I bought these to hang by the pool and deck and for the boat. They are useful as towels, beach blankets and sarongs. They dry super quick and the colors have held up wash after wash. Great price, good purchase. Perfect beach towel - wrap or even table cloth! We are tired of lugging heavy beach towels to the beach - these are the perfect weight to carry anywhere! I ordered the blue and white stripe. The weight of this is great for the beach or pool as it dries quickly. Nice to use as a wrap too. Not too bulky or hot. This towel was perfect on my trip to Greece! Wonderful for chairs. Extra length is great. Also perfect for packing. I love how unique these towels are. They are just what I need to go tot pool. They make for a great summer-weight throw, as well! Very pretty too! Decent sized, but lighter weight than I had hoped. Attractive towel, easy to take...just not as thick as I had hoped. Great towel. Have had them several months now and waqsh them frequently. They are holding up very well - great quality. Very cute, but thin and no absorbency. Keeping for decoration only. Disappointed for the price. Nice weight and color. Thought would be a bit more absorbic. Perfect for me. I wanted lightweight throws for deck lounge chairs. thin but it works great as a sarong. Promise of light weight, packable, absorbent and pretty design.